To do lists don't need to be complicated—plenty of people use a pen and paper for the job without any problem. And yet a new to do list app seems to come out every day. Why? Because keeping track of your tasks is an intensely personal thing, and people will reject anything that doesn't feel right pretty much instantly. That makes it hard to find the right app. To that end, we've been hard at work researching the best to do apps, trying to find the best ones for various use cases. We started by finding the best apps for every platform: Android, Windows, macOS, and iPhone/iPad. Research for these pieces was exhaustive: We tried the top-rated apps in every respective app store, spent a lot of time reading other roundups, and spent way too much time migrating our personal to do lists from one app to another. And now we’re offering you what we feel is the cream of the crop. 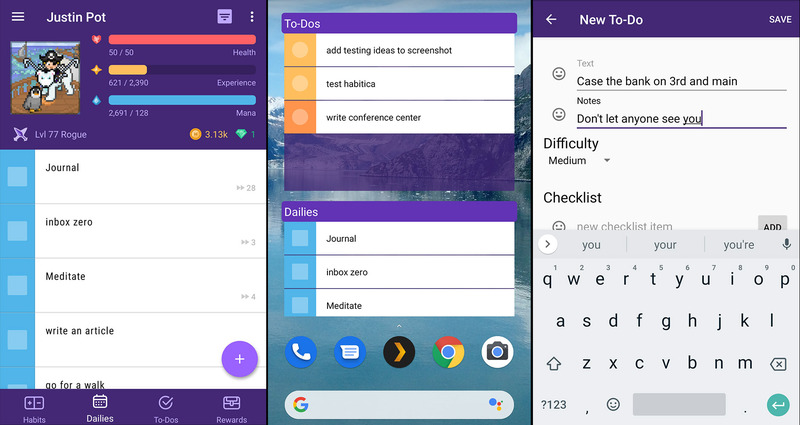 What Makes a Great To Do List App? Make it fast to add and organize tasks. Ideally a task is added and categorized in a couple taps or keystrokes. 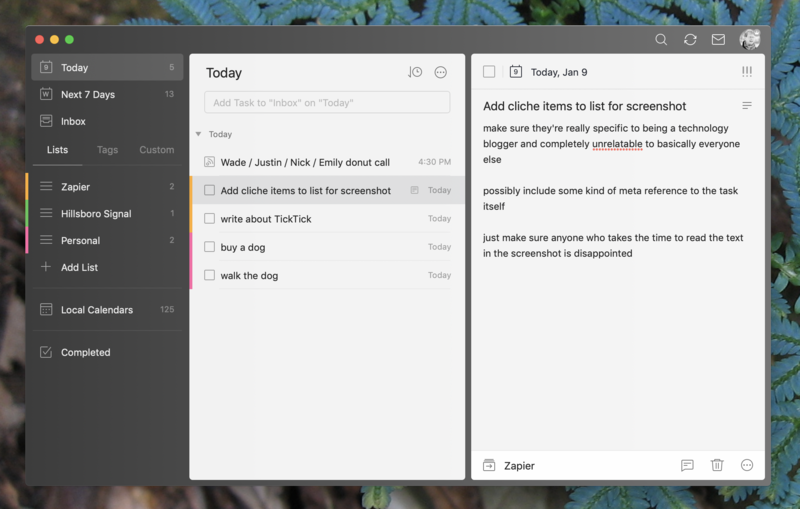 Offer multiple ways to organize your tasks. Tags, lists, projects, and due dates are all helpful, and the best apps offer at least a few categories like this. Remind you about self-imposed deadlines. Notifications, widgets, emails—the best applications make it obvious when something needs to be completed. Offer clean user interfaces. Well-designed to do apps fit into your workflow so you can get back to what you're supposed to be doing. Sync between every platform you use. Which platforms is going to depend on what you personally use, but we didn't consider anything that doesn't sync between desktop and mobile. We tried to find the best applications that balance these things in various ways. None of these apps will be right for everyone, but hopefully one of them is right for you. Let's dive in. Todoist isn't the most powerful to do list out there. It's also not the simplest. That's kind of the point: This app balances power with simplicity, and it does so while running on basically every platform that exists. That's a strong selling point—which is probably why Todoist is one of the most popular to do lists out there right now, with over 10 million users. Adding tasks is quick on every platform in our tests, thanks in part to natural language processing (type "buy milk Monday" and the task "buy milk" will be added with the next Monday set as your due date). You can put new tasks in your Inbox and then move them to relevant projects; you can also set due dates. Paid users can create custom filters and labels, and there are also some basic collaboration features. Todoist is flexible enough to adapt to most workflows but not so complicated as to overwhelm. Overall, this is a great first to do list app to try out, especially if you don't know where to start. TickTick is an up-and-coming to do list app that offers a wide array of features on just about every platform you can imagine. Adding tasks is quick thanks to natural language processing. There's also a universal keyboard shortcut offered on the desktop versions and pinned notifications and widgets on mobile, which makes it quick to add a task before getting back to what you're doing. Tasks can be organized using lists, tags, and due dates, and there's even the ability to add sub-tasks to any task. TickTick offers all of this with apps that feel native—the macOS version is distinct from the Windows version, for example, in ways that make sense given the differences between those two systems. TickTick also offers a few features that are above and beyond what other apps offers. First of all there's a built-in Pomodoro timer, allowing you to start a 25-minute work session for any of your tasks. Second, there's integration with various third-party calendars, allowing you to see your tasks and your appointments in one place. It's a great collection of features and well worth considering, especially if you sync between various platforms. 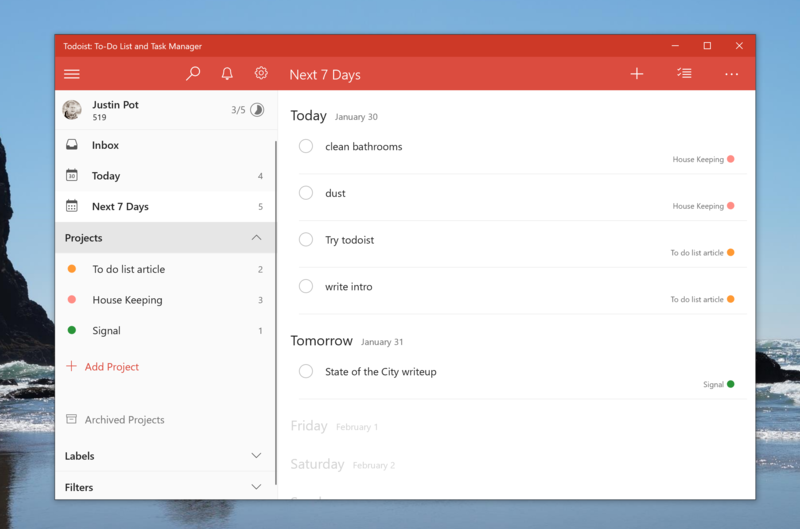 In 2015, Microsoft bought Wunderlist and put that team to work on a new to do list apps. Microsoft To-Do is the result of that, and you can find Wunderlist's DNA throughout the project. The main interface is clean and friendly, adding tasks is quick, but there's a lot of flexibility below the surface. There are a few Wunderlist features still missing in To-Do; collaboration isn't offered, for example, and there's no macOS version. Some longtime Wunderlist users might want to stick with that application, even though Microsoft plans to shut it down at some point. A free migration tool can pull tasks over when the time comes, so there's no rush to switch. To do list apps tend to fall into two categories: the complex and the minimalist. Things is somehow both. That is about the highest praise I can give a to do list app. This is an application with no shortage of features and yet it always feels simple to use. Adding tasks is quick and so is organizing them, but there's seemingly no end of variation in ways to organize them. Areas can contain tasks or projects; projects can contain tasks or headers that can also contain tasks; even tasks can contain sub-tasks if you want. It sounds confusing but it isn't, which really speaks to how well Things is designed. Other applications offer these features but Things does it in a way that never feels cluttered, meaning you can quickly get done with looking at your to do list and get back to whatever it is you're doing. Combine this blend of functionality and beauty with features like a system-wide tool for quickly adding tasks, integration with your calendar so you can see your appointments while planning your day, intuitive keyboard shortcuts, reminders with native notifications, and syncing to an iPhone and iPad app. The only downside here is the complete lack of versions of Windows and Android, though this decision is probably part of what allows the team to focus on making such a clean product. If you're an Apple user, you owe it to yourself to try out Things. Things price: The macOS version costs $49.99 but offers a 15-day free trial. The iPad version costs $19.99 and the iPhone version costs $9.99. Omnifocus is nothing if not flexible. This Apple-exclusive application is built around the Getting Things Done (GTD) philosophy trademarked by David Allen, but an array of features means it can be used for just about any organizational system you can imagine. There are three different kinds of projects you can set up, for example, depending on whether you need to do tasks in a specific order or not. 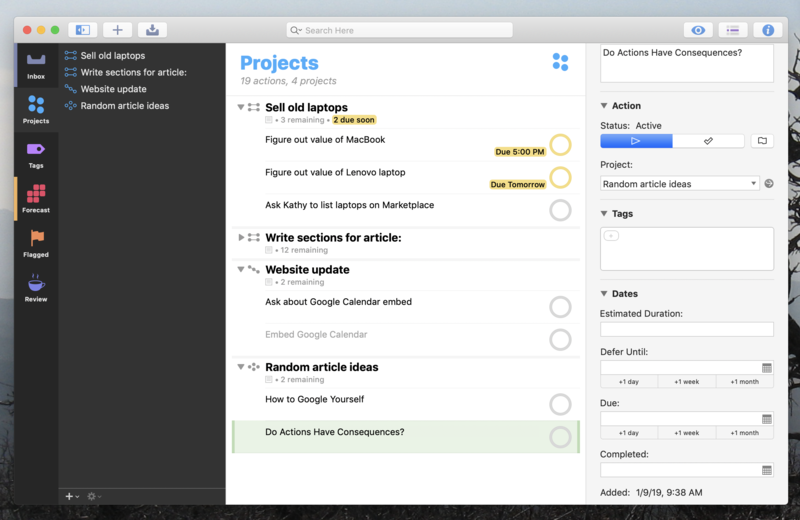 There are six main views by default, allowing you to organize your tasks by things like due date, projects, and tags. You can even add more views, assuming you have the Pro version. You get the idea. 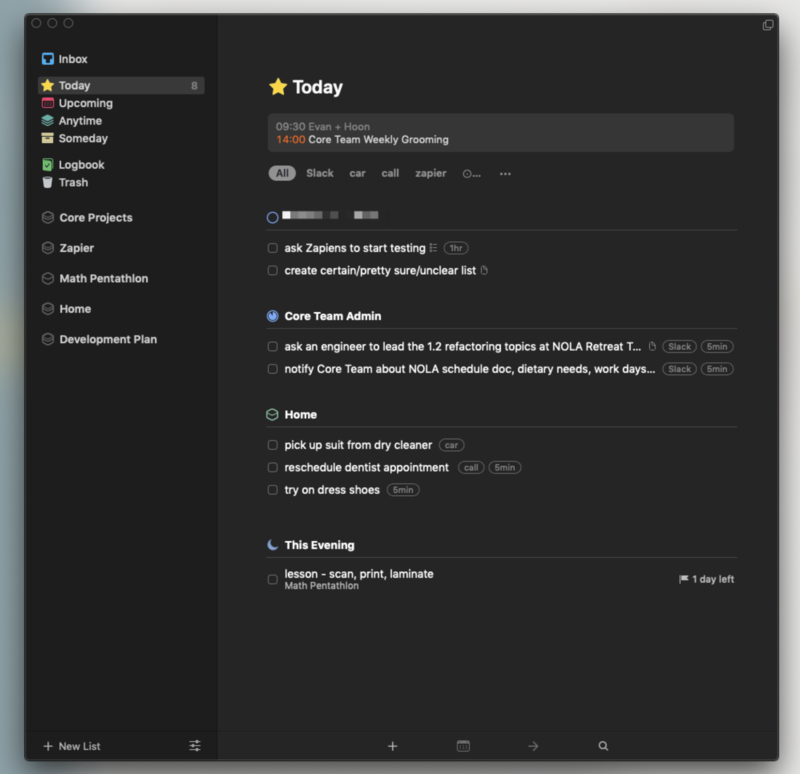 Omnifocus is a power users dream, with more features than anyone can hope to incorporate into a workflow, which is kind of the point: If there's a feature you want, Omnifocus has it, so you can organize your tasks basically any way you can imagine. Syncing is offered only between Apple devices. There is a web version, currently in testing, but it's intended for occasional usage away from your Apple machines than anything else. Non-Apple users should look elsewhere. OmniFocus price: OmniFocus for Mac starts at $39.99 after a 14-day trial. The Pro version, which allows you to customize the sidebar with your own views among other features, costs $79.00. The iPhone and iPad version starts at $39.99 and also offers a 14-day free trial. Games are fantastic at motivating mundane activity—how else can you explain all that time you've spent on mindless fetch quests? Habitica, formerly known as HabitRPG, tries to use principles from game design to motivate you to get things done, and it's remarkably effective. You can add tasks, daily activities, and habits to a list. You also have a character, who levels up when you get things done and takes damage when you put things off. You can also earn in-game currency for buying offline rewards, such as a snack, or in-game items like weapons even silly hats. This is even better when you join a few friends and start a party. You can all fight bosses together, but be careful: Fail to finish some tasks on time and your friends will take damage. If that doesn't motivate you nothing will. What's the downside? Habitica isn't a great to do list for managing long-term projects, so you might need something else for that. But if motivation is your problem, Habitica is well worth a spin. Habitica Price: Free. A $5 per month subscription unlocks features like task histories and exclusive in-game items. Gmail and Google Calendar have long offered an integrated tasks list but for a long time there was no way to access those tasks on mobile. 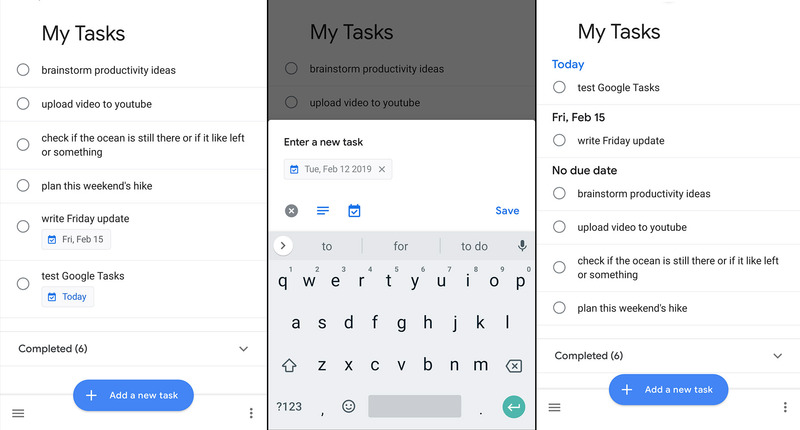 Google Tasks changed that, offering an Android and iPhone/iPad version to compliment the web version. The app itself is spartan. 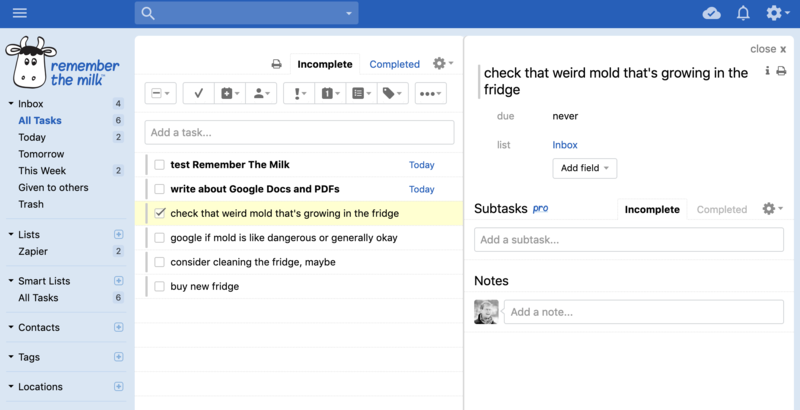 Adding tasks is quick, particularly if you spend a lot of time in Gmail anyway, but there's not a lot of organizational offerings: There are due dates, lists, and nothing else. So this isn't the most robust task list, but the best to do app is one that's always handy. If you're the kind of person who always has Gmail open on your computer it's hard for any application to be more handy than Google Tasks. The mobile versions make those tasks accessible on the go. Most to do lists give you no control over your data. Your tasks live inside the app, not in a document you can edit, and syncing is handled by whichever company made the app. If you don't like this, todo.txt is a great alternative. The idea: Your to do list is a literal text document which lives on your computer. Every line in the document is a task. A few standard formatting allows for sorting. Capital letters in brackets, ie (A), set the priority of a task. Single words starting with a plus sign, ie +ToDoArticle, assign tasks to a project. Single words starting with @, ie @computer, assign a context to a project. Adding a lowercase x to the beginning of a task means that it is complete. There are a few other additions, but you get the basic idea: It's a format for organizing your tasks in a text document. There's an official command prompt app for adding and completing tasks, but there are also graphical interfaces for every most platforms: todotxt.net for Windows, TodoTxtMac for macOS (seen above), SwiftoDo for iPhone, and Simpletask for Android are all great options. It's not for beginners, but it's extremely flexible once you you get a handle on things. If sticking to a system is hard for you I highly recommend giving this system a try. todo.txt price: Free, though some dedicated apps have a small price attached for extra features. Wish you could find a full-featured GTD system that syncs outside the Apple ecosystem? Nozbe fits the bill. This web application offers native versions for various platforms and also offers a wide array of organizational features. Tasks can be sorted into projects, and you can even create project templates if your work tends to have a certain amount of repetition. Nozbe also offers collaboration features, meaning you can use it to organize tasks as a team. The app itself can be a little complicated to get started with, owing to the wide array of features. Take some time to learn everything, however, and you'll find it's all less complicated than you're imagining. Nozbe price: Subscriptions start at $8 a month, and there's 30 day free trial. Did you forget about Remember The Milk? It's been a long time since this application got many headlines, but it's been quietly competent all of these years. And it's still one of the best options for users who don't like taking their fingers away from the keyboard. 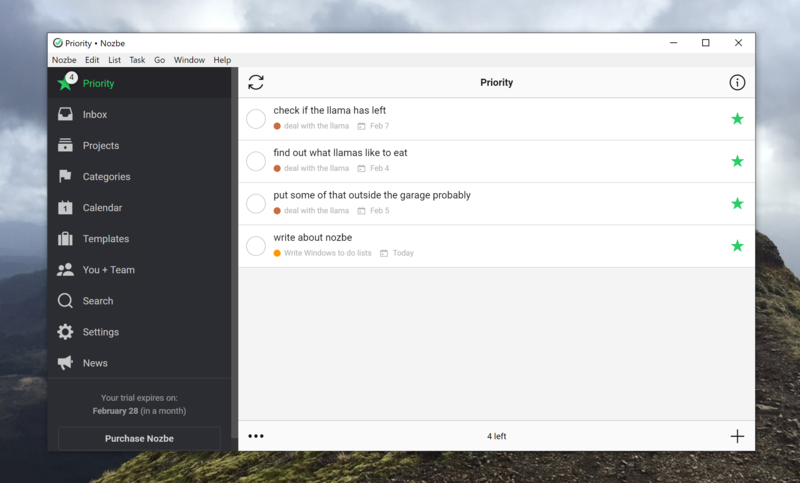 The desktop version of this app makes it easy to add a bunch of tasks in quick succession. But Remember The Milk also provides very straightforward mobile versions, as well as syncing with Outlook for Pro users, meaning this a great way to quickly add tasks and have them show up everywhere. Give this app a chance if you haven't thought about it for a while; it might surprise you. 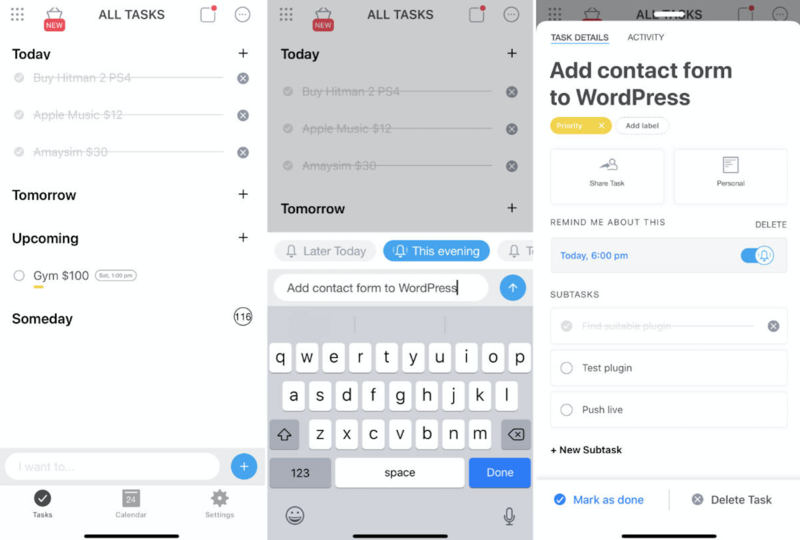 Any.do offers a really slick mobile app that makes it quick to add tasks, organize them into lists, and add due dates. But where this application really shines is with its daily "Plan my Day" feature, which forces you to schedule when you'll accomplish your various tasks so that you remember to actually do things. Any.do also integrates nicely with Google and Outlook calendars, allowing you to see your appointments and your tasks in one place. This is exactly what you need of you're the kind of person who adds things to a list and forgets about them. The web version isn't quite as slick as the mobile version, because it can feel cluttered at time and doesn't offer much in the way of keyboard shortcuts. Still, Any.do’s mobile version along makes a compelling reason to give it a shot. Project Management apps like Trello and Asana can be very useful as to do lists, so look into those if none of these systems work for you. Note-taking applications like Evernote, OneNote, and Google Keep can also work quite well. Sticky note applications can also work in a pinch. So can a piece of paper. Don't overthink things! Wunderlist used to be a no-brainer for lists like this, and is still quite nice. The problem, as stated above: Microsoft bought Wunderlist and is shutting it down at an undetermined point in the future. 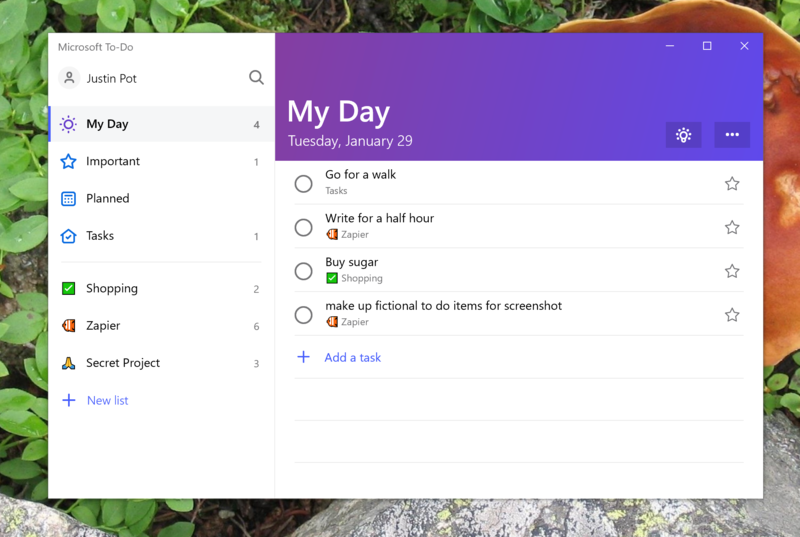 The intended replacement, Microsoft To-Do, is outlined above. Google Sheets can be your to do list, as my colleague Deb outlined. Finding the right task management system is hard because it's so personal. To that end, I'm sure there will be other apps to check out in the comments below, so please keep reading there if you want even more suggestions. This post was originally published in April 2018 by Andrew Kunesh and updated in April 2019 to refine the list of options.